Downton Abbey has captured the imagination of the nation. Written by Oscar-winning writer Julian Fellowes the show has become the benchmark for quality drama, and a commentary on all things British. 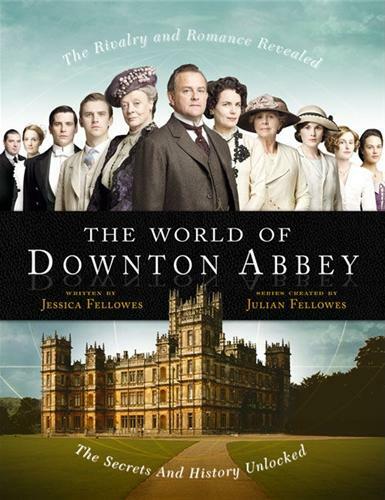 Downton Abbey portrays a world of elegance and decadence, a world of duty and obedience and a world of romance and rivalry: this companion book takes fans deeper into that world than ever before. Step inside one of the most beautiful houses in Britain, past Carson the butler at the front door and into the grand hallway. Catch a glimpse of the family having drinks in the drawing room before dinner, dressed in their evening finery, whilst Lord Grantham finishes writing a letter in his study. Then climb the grand sweeping staircase to the maze of rooms upstairs and peak through Lady Mary’s open door to see Anna, her maid, tidying scent bottles and jewellery on the ornate dressing table. Having admired the view of the parkland surrounding the house, follow Anna down the servants’ stairs and into the kitchens to watch Mrs Patmore frantically preparing dinner. Mrs Hughes keeps a watchful eye from her study and the world of Downton comes alive before you. Experience the inner workings of the downstairs life and be dazzled by the glamour of upstairs life with profiles of all the major characters, interviews with the actors, behind the scenes insights and in-depth information on costumes and props. Using a structure to illustrate the main themes of the series, such as the family, daily life, war, servitude, society and style different characters will be focussed on for each chapter. Also the text will give insights into the political and social history of the period, and real-life characters and situations for comparison and illustration. This is a must for any fan of Britain’s most watched period drama. Pre-Order today from Amazon US and Amazon UK, or from The Book Depository (UK edition or US edition), which ships everywhere for free! Donate and download exclusive content and top sketches at http://www.bbc.co.uk/rednoseday A host of stars, including Jennifer Saunders, Joanna Lumley, Harry Enfield and Victoria Wood join forces for a period-drama-themed spoof for Red Nose Day.